In distributed and mobile environments, the connections among the hosts on which a software system is running are often unstable. As a result of connectivity losses, the overall availability of the system decreases. 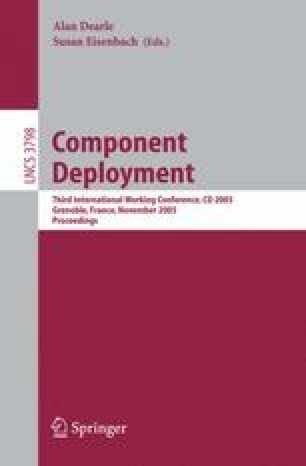 The distribution of software components onto hardware nodes (i.e., the system’s deployment architecture) may be ill-suited for the given target hardware en-vironment and may need to be altered to improve the software system’s avail-ability. Determining a software system’s deployment that will maximize its availability is an exponentially complex problem. Although several polyno-mial-time approximative techniques have been developed recently, these techniques rely on the assumption that the system’s deployment architecture and its properties are accessible from a central location. For these reasons, the existing techniques are not applicable to an emerging class of decentralized systems marked by the limited system wide knowledge and lack of central-ized control. In this paper we present an approximative solution for the rede-ployment problem that is suitable for decentralized systems and assess its performance.